The second (driver's side) motion bracket was due to be delivered to the SVR on 27th June, bringing final completion of the chassis a stage closer. Visitors to our site at Bridgnorth should not be dismayed by what appears to be a dismantling operation: the frame structure is being briefly disassembled so that all mating surfaces and joints can be thoroughly cleaned and prepared for riveting, which will be a sound investment for the engine's future well-being. 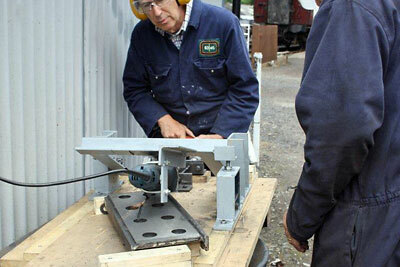 Plans for the riveting operation are well advanced, and Tony will report on this in next month's updates. Paul Anderson and Chris visited the Engine House on Monday 25th June for a preliminary look at the driving wheel pattern prior to its transportation for final assessment before competitive quotes are sought for casting the wheels. With the friendly co-operation of Engine House manager Nicky Vale ("Can we have it back when you've finished with it, please? "), Paul and Chris plan to pick up the eye-catching exhibit on 2nd July and take it to Boss Patterns of Coventry. Many thanks to Brent Cameron of Boss for his kind offer to check the pattern over. Thanks to the success of the Wheel Appeal (see below), we will be in a position to have all six driving wheels cast by early next year. It is likely that an initial casting of one wheel will be commissioned once the pattern has been approved and the contract let. We can't afford to make any mistakes here. 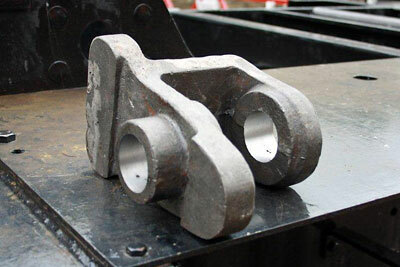 A necessary preliminary to the wheeling operation is the fitting of the twelve spring hangers, and these are to be cast shortly so that our expert team of Richard Fraser and Dave Struckett can undertake the time-consuming job of machining them. Barbara is again appealing for tombola prizes for our stand at the Autumn Steam Gala. The tombola is an excellent money-raiser for 82045, and we would be very grateful for any suitable donated items. These can be dropped off at Bridgnorth on Mondays (the 82045 gang's regular working day) ready for collection, or brought along to the Peep Behind the Scenes Weekend (21st/22nd July). Thank you! The initial burst of Wheel Appeal publicity in the spring proved very fruitful, with a healthy balance in the ring-fenced Appeal account to prove it. So far, we have raised approximately one-third of the estimated total cost of wheeling 82045 - not bad since March! The pessimist would say "Ah, but what about the other two-thirds? ", which is a fair question and one that is being energetically addressed. Look out for further publicity activities as the year wears on, as we cannot relax our efforts for one minute. 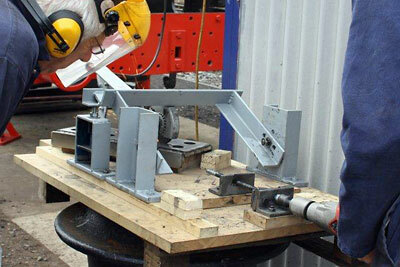 The signs are good that we will achieve our goal of a rolling chassis by late 2013/early 2014. Those of you who have not yet decided to support us will be very warmly welcomed, the standing order being the life blood that enables Chris to plan forward accurately in regard to expenditure. 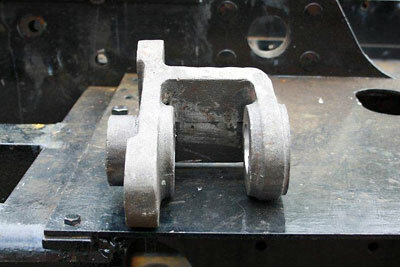 By far the greatest portion of the cost of wheeling is the casting and machining of the drivers - items such as axles and tyres are relatively modest - so once we have achieved this, we will be on the home straight and ready to start raising funds in earnest for the boiler. Chris continues to maintain a vice-like grip on our finances (Scots Presbyterian ancestry standing him in good stead! ), and is hoarding funds on two fronts at present, for the wheels and the cylinders. The latter job is, of course, under way with an agreed system of staged payments to Cerdic Foundries. Forward planning is vital, as we cannot risk financial embarrassment or indebtedness. Peter Line and Brian Malyon grinding the lubrication grooves on the manganese liner faces using a specially made jig designed by the ingenious Peter. Lubrication of the liner faces is by grease rather than oil, one of the many labour-saving modifications featured on the BR Standard locomotives. A partly machined brake hanger bracket. An engineman of the future? 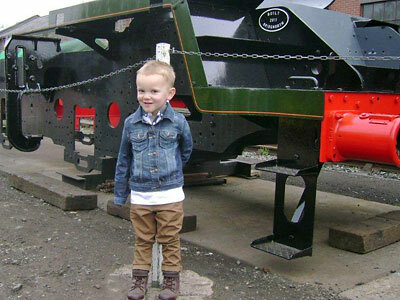 Our youngest Life Member, three-year-old Charlie Bull, stands proudly in front of the frames of 82045 at Bridgnorth in early June. Dad Matt Bull is an enthusiastic supporter of the project, and is clearly doing all he can to ensure his little son follows in his footsteps! It is absolutely vital for the future of our hobby that we pass on our love for the steam railway to the younger generations. Photo by Dad Matt Bull.